The thing about travel which appeals the most is surely the experiences you have. They are more than the place, they are more than the food and they are more than the people. 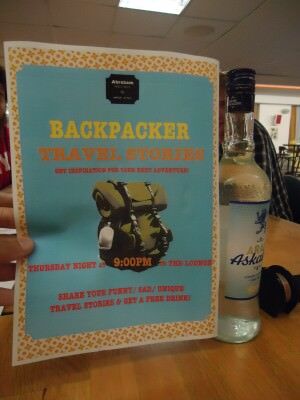 When I was staying in the awesome Abraham Hostel in Jerusalem, I found out they have a really cool “Backpacker Travel Stories” night! This is something every hostel should do! Thirsty Thursdays in Jerusalem – free shot for a backpacker story? Yes, please! and they chose to hear the hyena feeding Harar story. 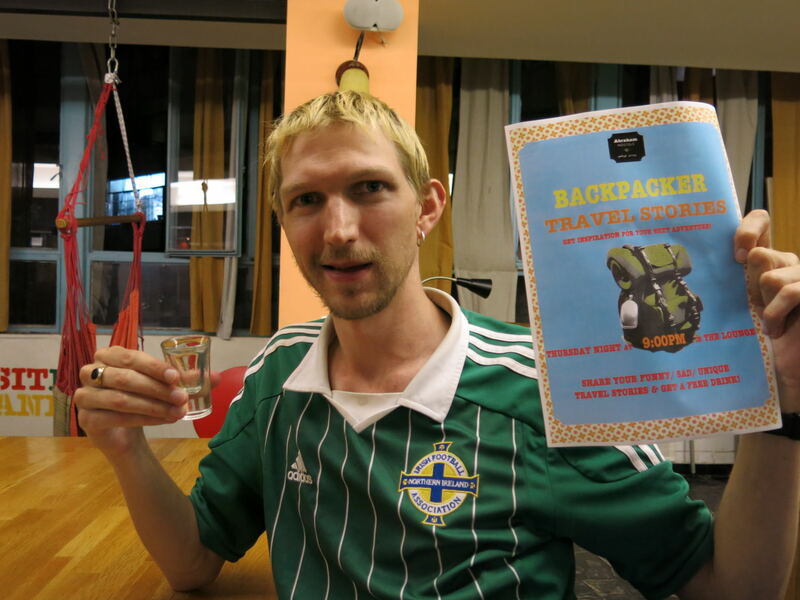 In the Abraham Hostel I met Yoni, who hosted the backpacker tales night and has travelled a lot too. Yoni also did the Tiger Leaping Gorge hike like myself and ended up getting lost along the way and he shared his tale. Another guy spoke about backpacking in Pakistan, and an English guy made it to some remote island off the coast of Madagascar (I think) on the worst transport possible. Just for telling the story you get a free drink. We all had a shot of Arak and it was a great night. The next morning we had to be up for sunrise at Masada. Backpacker Stories time in Jerusalem on a Thursday for a free drink! The reason for this Thirsty Thursday tonight is not just because I loved Abraham Hostel and that this post is overdue, but I’m meeting up with Yoni again tomorrow, in Hong Kong!! The irony of it all is that I met Yoni in Israel in his place of work, and he is meeting me in my old place of work – Delaney’s Irish Pub! Cheers and thirsty Thursdays to you all! This entry was posted in Abraham Hostel, Abraham Tours, Central Asia/Middle East, Daily Features, Destinations, Israel, Jerusalem, Thirsty Thursdays. Bookmark the permalink. ← The Dapper Gents Guide To Travel! In term of availability, is it ok to arrange sightseeings and the rest after arrival in Israel. Is there enough travel agencies to book tours after you arrive and check inn some hotel.